Welbedacht Hat Trick 2006 won the Trophy for Best South African Red Blend over £10 at the 2009 Decanter World Wine Awards in London. 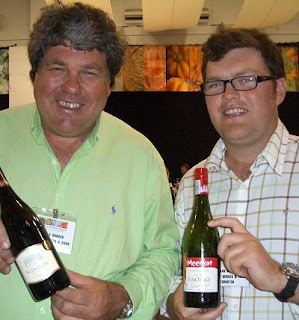 Welbedacht Hat Trick 2006 is a Cape Blend of 50% Pinotage, 25% Syrah and 25% Merlot. Cellar Master Jacques Wentzel says 2006 is fast becoming a superb vintage for fruit flavours, which lie at the heart of the Welbedacht Hat Trick. The name ‘Welbedacht’ means “well thought out” in Dutch - a fitting name for this increasingly prestigious wine farm where great care is taken to express each wine and cultivar’s unique character. “As only traditional methods are used to make our wines, we believe that the 2006 Welbedacht Cape blend embodies all the attributes of a rare hat trick, and as such, a black label is awarded to it,” he concludes. Congratulations to everyone at Welbedacht -- and to Pinotage for gaining both the red single varietal Trophy (see below) and for being the major part of the red Bldn Tropy.